Thank you for visiting another one of Greenwood Automotive's online listings! 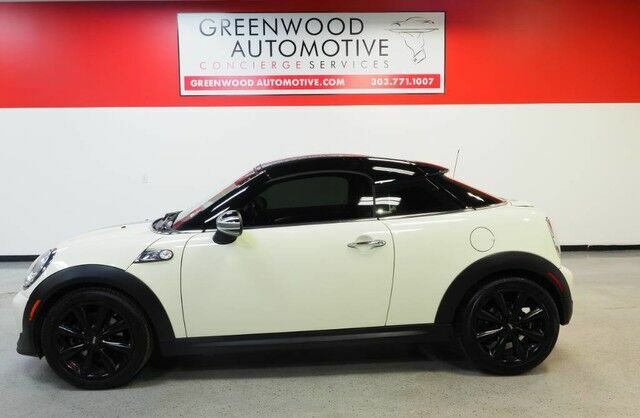 Please continue for more information on this 2013 MINI Cooper Coupe S with 58,333mi. CARFAX BuyBack Guarantee is reassurance that any major issues with this vehicle will show on CARFAX report. When it comes to high fuel economy, plenty of versatility and a great looks, this MINICooper Coupe S cannot be beat. This MINI Cooper Coupe's superior fuel-efficiency is proof that not all vehicles are created equal. Exceptional in every sense of the word, this incredibly low mileage vehicle is one of a kind. Beautiful exterior. Clean interior. This MINI Cooper Coupe is so immaculate it is practically new. Added comfort with contemporary style is the leather interior to heighten the quality and craftsmanship for the MINI Cooper Coupe The MINI Cooper Coupe S is exactly what you would expect out of a MINI. It's decadently opulent, meticulously engineered and unapologetically grandiose. More information about the 2013 MINI Cooper Coupe: The MINI Cooper Coupe and Roadster models are among the smallest vehicles for sale in the U.S., yet they're true sports cars in many ways, offering quick acceleration and excellent, go-kart-like handling. The Roadster brings top-down thrills no matter how fast its driven. MINI claims the coupe is the fastest-accelerating model from the brand ever and it has the highest top speed in the brand's history. Those who crave high performance will want to head straight to the John Cooper Works (JCW) Roadster and its stronger engine and additional performance upgrades. It's a feat that even considering that, the JCW earns up to 35 mpg on the highway. Interesting features of this model are fun-to-drive qualities, Quick acceleration, responsive handling, distinctive color and trim options, great gas mileage, and easy to park and maneuver WWW.GREENWOODAUTOMOTIVE.COM for all Photos Our Dealer Handling fee of $499 is included in our advertised price. Government fee's and licensing are additional costs. For best service and to check availability or to set an appointment to see and drive call Steve direct at 720-339-1516 or Marc at 303-552-7909 For more information. FINANCING AVAILABLE. TRADES WELCOME. *VEHICLE IS FULLY INSPECTED BY OUR MECHANIC. We are located 4 Blocks West of I-25 on North side Of Arapahoe, Behind US Bank at Syracuse St.